Bird control in Portland, Or is very common because birds can become a big pest when they are roosting in on your house or when you have to remove birds from an attic. The most important part in handle Oregon bird problems is that you have to be able to identify before you can control bird problems. The Migratory Bird Treaty Act of 1918 was set in place to protect migratory birds and depending on the bird you may or may not be able to do anything at all. So before the problem can be solved you need to identify what type of bird and what options if any you have. We are a professional full-service wildlife control company insured and licensed to work in Oregon. Some of our main services include bird removal from houses and vents. Depending on the location this can be a quick solution or a very time consuming job. If you have bird in a vent that has a long run to the drier, it can become more difficult. We are equipped to handle any size Oregon bird control job. We are a poison free business that takes pride in providing live bird removal whenever possible. Sparrows, starlings, and pigeons are the main pests that we deal with for these kind of calls. If you need help with any wildlife control problem contact us today. Bird will set up nest and have baby birds in an attic during the spring months in Oregon. This can be dangerous for the birds and the homeowners cause all the material the birds bring in could be a fire hazard. After the birds are removed it is imporant to make sure the attic is cleaned out and not bird nests or other material left behind. Do you hear bird noises inside you wall or inside your fan vent? Do you have bird poop on the side of the house? We handle bird control problem both residential and commercial. Whether you have small birds living in your microwave fan vent or a lot of pigeon's pooping all over your building, we can solve them all. Don't stress about trying to scare the birds away or having them keep you up all night. We can remove the problem birds along with properly sealing and bird proof your house. Even if you do not have a current Oregon bird problem it is always a good idea to prevent these problems which can save you money in the long run. Prevention for all wildlife problems is the best way to go. Whether you would like to have us completely seal your house up or get an inspection to show you all areas that need to be sealed up, properly bird proofing a home before you birds move into your house is a good idea. Pigeons are one the main pest birds that you have to deal with in Oregon. They have a very large population and can be found from farm fields to major downtown cities. There ability to survive and adapts makes them a big problem in any location, but we are able to handle any Oregon pigeon removal work, whether you have pigeons on a commercial building or in you house vent. One of the main damages cause by pigeons is their poop which can carry diseases and bacteria. ​Many times when you are dealing with a large commercial bird problem it will be pigeons. The most dangerous risk involved with pigeon control is the droppings and disease they can spread to humans. 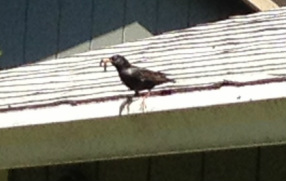 This is what makes pigeons the most common pest problem pest bird in Portland and all of Oregon. When pigeons are on the roof tops and dropping are creating a hazard at your office building we can help solve the problem. We are able to provide services that remove bird nest in dryer vent which can be a big fire hazard for a house. We have equipment that is designed to safely remove debris like a nest or lint from the dryer duct. This allows us to handle any problem you are dealing with because in some cases the bird nest is way back from the dryer vent and you need an extension to reach it. We have bird traps that capture the baby birds inside the vent before we do the cleaning out of debris. After we make sure all birds are removed we are able to start removing birds from the dryer vent in Portland, Oregon. This is when the equipment comes in handy to make the service quick and done correctly. We use an air compressor with a hose made specifically for cleaning out ducting. We also have a brush attached to a power drill that does a good job breaking up any stuck material. After everything has been removed we provide sanitation services that make sure all the bird poop is cleaned.